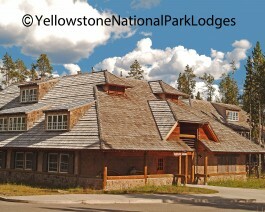 Canyon Lodge and Cabins is a sprawling facility near the Grand Canyon of the Yellowstone. The accommodations include lodge rooms (located in two separate lodge buildings) and multiplex cabin-style units. Dunraven Lodge and Cascade Lodge are a part of the larger Canyon Lodge facility, these are two motel style buildings located next to each other. The only additional guest service in these buildings is vending machines for either snacks or soda. The balance of the lodging is made up of multiplex units called Western Cabins and Frontier Cabins. The cabins, built in the 1950’s and 60’s are arranged in loops. All hotel and cabin rooms have private baths. The main lodge building includes a reception desk, gift store, picnic/deli shop, full service restaurant and cafeteria. Horseback rides are also available from the nearby corrals.